Beyond Mearley Hall the softer Ribble Valley landscape of hedges and cows quickly gave way to drystone walls and sheep, the sign of a changing geology. Here is the transition, visible in the features on the ground, from the pastoral fields of glacially deposited boulder clay to the coarse, spiky grasses and rushes of the Pendle escarpment. I started to climb gradually to Pendle’s photogenic north face, a whale-back giant incised with deep clefts. 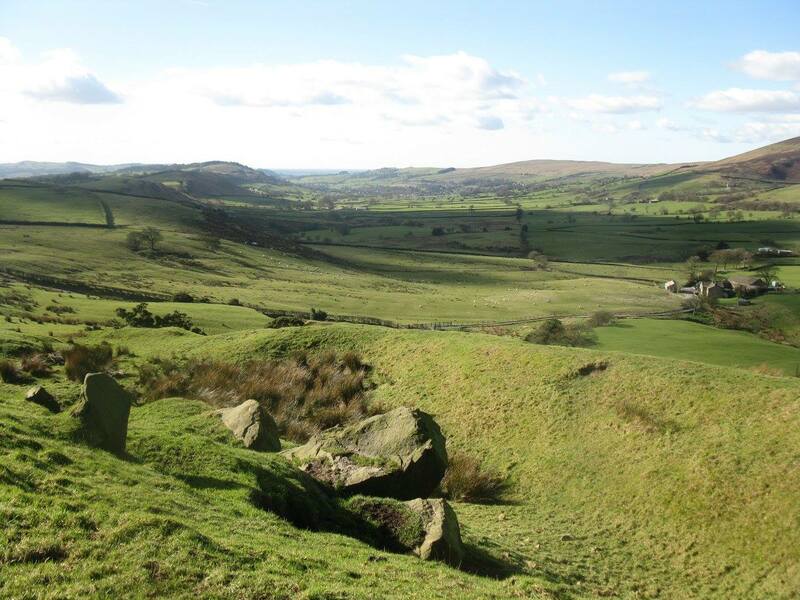 Known locally as cloughs, these water-eroded cuts in Pendle’s steep-sided flank reveal exposed geological bands of lime, shale and grit, layered in sandwich fashion on top of each other. The hill from this side was used dramatically as the representation of the primitive god-fearing north in the 1960’s film, Whistle Down The Wind. Sheltered underneath it was the barn in which Hayley Mills and her ragtag gang of rough-hewn children thought they had discovered Jesus in the form of wanted criminal Alan Bates. The barn is still there, down a back lane from Downham, just a few miles from where I walked. 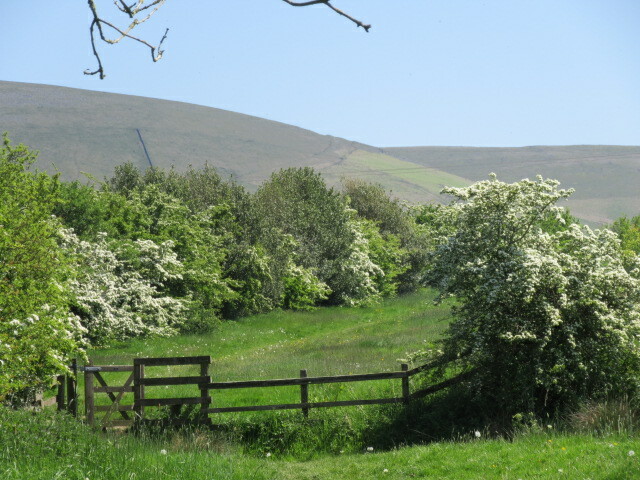 A footpath led uphill across Pendleton Moor at the western end of Pendle Hill. It leads to the crest of the ridge, the bleached grassy spur of Apronfull Hill, from where a stone track forms one of the popular walking routes to Pendle’s summit. Standing on Apronfull Hill on the mid-morning of a June day, the sun was hotting up. A water break on the ridge top was my last chance to view home before leaving the path to Pendle Hill summit and turning south. I could retrace the three miles back to my house following the lowland hedgerows of the Ribble Valley snaking back to the A59 bypass. 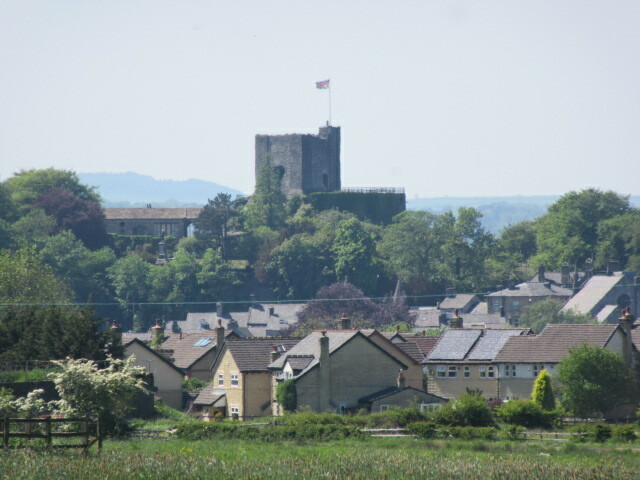 Beyond this badger bloodbath of a road is Clitheroe, its little grey castle keep perched on a clump of limestone, dreamily watching over the 19th century terraced town like some ancient Babylonian fortress. From Clitheroe looking north rise the uplands. First, wooded Longridge Fell, the most southerly named ‘fell’ in England, along the lower slopes of which Oliver Cromwell rode eastwards with the New Model Army in the wet summer of 1648 to engage with Scottish Royalists at Preston. 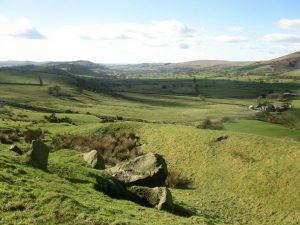 Then there is the wilderness of the Bowland Fells, stark, dark ridges, over which Roman soldiers marched north to military bases on Hadrian’s Wall and the Pendle ‘Witches’ were carted off to their doom, executed in Lancaster, in 1612. Despite recent open access to the Bowland Fells, closed for walkers to generations, these moors are still the preserve of cruel money-making grouse shoots. Gamekeepers, acting on behalf of their lords and masters, have single-handedly managed to furtively decimate the nationally significant hen harrier population through a deadly mix of guns and poison. Ironically, the hen harrier is the symbol of the Forest of Bowland Area of Outstanding Natural Beauty and appears on local road signs. Sadly you will not see a single one of these raptors sky dancing over the Lancashire moors. Pendle Hill is the roof of Lancashire. Looking north and west is a breathtaking sweep of countryside from the silvery sparkle of the Lancashire coast to the mountain tops of Yorkshire’s ‘Three Peaks’. Looking south I have even viewed a distant Snowdon glowing blue at sunset from the heights of Pendle. For centuries it has been a place where travellers have been inspired by their own visions. In 1652, when the political and religious world was turned on its head at the height of Oliver Cromwell’s Interregnum, a long haired troublesome preacher called George Fox walked north from Derby, without any great plan but with plenty of raving about the imminent arrival of God. He slept under hedges, in haystacks and used ferns and bracken as his mattress. 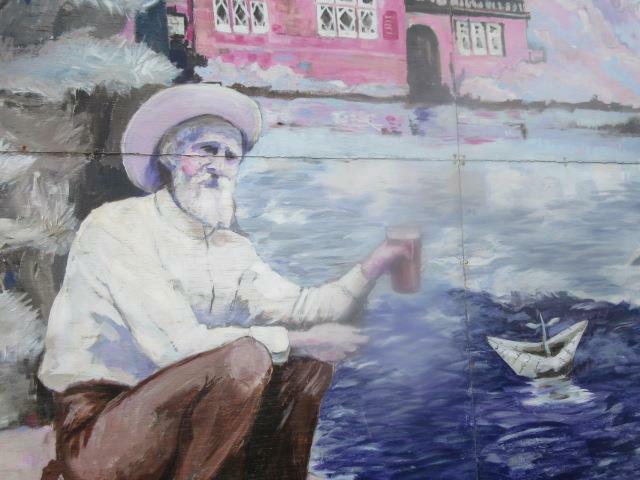 He ate and drank little, walking all night in a great deal of mental confusion to receive the teachings of the Lord. He gathered crowds in obscure places, fields and rock outcrops, preaching his simple message of religious truth. Fox ended up climbing the steep end of Pendle Hill from Barley village where the inspiring view north to the Lancashire ‘sea’ cleared the fog from his head and gave him his life’s purpose. Drinking from a spring near the summit – it’s still there if you can find it – he realised that the poor and simple people of this upland wilderness were ready for the message he carried. Descending Pendle, what did George Fox do? He carried on walking. He walked north through the West Riding Dales, rural Westmorland and into Furness, Lancashire beyond the sands, seeking ‘Seekers’ along the way amidst the plain-speaking, hard-working folk of the rustic north country. Fox knocked on doors, invited himself into pulpits, gathered congregations, and eventually arrived at Swarthmoor Hall near Ulverston. By the end of his long distance journey he had shaped his own religious mass movement on foot – the ‘Quakers’ or the Society of Friends. Such is the power of walking. Two hundred and sixty years after Fox’s vision on Pendle, an Edwardian mill worker had another spiritual vision on the same hill. This was Tom Stephenson, aged nineteen, on his first ramble. He fell in love with the view and with the freedom of the great outdoors. Looking north beyond the green hedges of the Ribble Valley to an unfolding wave of ridges, most distinct in the peaks of Ingleborough and Penyghent, it was this heavenly vista of an unspoilt countryside ripe for exploring that kick-started Tom Stephenson’s love of walking. The paths on Pendle Hill led Stephenson to escape mill town life and forge a new career as a writer and journalist. He edited Hiker and Camper magazine and reported from the frontline of the Kinder Trespass in 1932. Becoming press secretary, then secretary, of the fledgling Ramblers Association, Stephenson campaigned at outdoor rallies for access to mountains and moorlands. The Countryside Alliance and its pro-hunting lobby are more likely to catch the ear of today’s Conservative government than the modern day Ramblers. But in the 1940’s the Ramblers Association was a significant political force, a strong influence shaping the groundbreaking countryside legislation of Attlee’s Labour government. Tom Stephenson sat on the various advisory committees which initiated the passing of the 1949 National Parks and Access to the Countryside Act. Tom Stephenson’s other great legacy celebrated its fiftieth anniversary as I set off to London. Writing an article in the Daily Herald in 1935, Stephenson, no doubt recalling his happy days tramping over Pendle Hill, set out his vision for a long, green trail along the backbone of northern England. Officially opening in 1965 it took 30 years for the ‘Pennine Way’ to become a reality on the ground. This first government-funded long distance path, with a guidebook written by Stephenson, paved the way for our modern network of National Trails. The ridge top footpath over Apronfull Hill is a prehistoric highway, littered either side with the cairn remnants of Neolithic and Iron Age tombs. I carried on walking up the ridge past a feature marked on the OS map as the Chartists’ Well. Difficult to locate on the ground, just one of many sluggish peaty trickles amidst broken cairns, the name is a reminder this footpath was still a focus for human activity in the 19th century. The well celebrates a meeting of local Chartists in 1842, who raised hustings from the ancient earthworks to create a moorland rallying point for 2,500 discontented men, women and children from the surrounding textile villages and towns. Looking down on the mill village of Sabden, where manufacturer Richard Cobden had established a calico printing works, the crowd were addressed by an Accrington chair maker, William Beesley, who, two days later brought the Chartists’ leader, Feargus O’Connor, to nearby Padiham. The 1840’s were the high point of Chartism, a grassroots political movement that had evolved from the same working class hardship, hunger, unemployment and poverty which had sparked the 1817 Blanketeers March from Manchester to London. When William Beesley addressed the crowd at Apronfull Hill on a hot June Sunday in 1842, the Chartists had just presented a second petition to the House of Commons signed by well over three million names. The petition sought recognition of the six points of the Charter which demanded electoral reform to ensure working men, and not just men of property, had the vote and to remove the excesses of rife corruption amongst MP’s. The petition also raised concerns that have a familiar ring today: loss of liberties, the heavy handed approach to policing demonstrations, unfair taxation and poor working conditions. In an echo of the present day ‘all in this together’ mantra, the dominant sound bite of the coalition government years, the Chartist petition of 1842 included an attack on the outrageous income of Queen Victoria. She earned in excess of £164 a day. When the Charter was overwhelmingly voted down by the House of Commons, the people of the industrial north took to the hills to protest, the moorland high points surrounding the textile towns being the traditional meeting places for political rallies away from government spies, jittery town officials and the sabre-rattling yeomanry who had showered themselves in bloody glory in the 1819 massacre of ‘Peterloo’. From the site of the Chartists’ 1842 protest I soon turned off the path leading to Pendle’s summit and headed south to the craggy outcrop of Deerstones where I spotted a kestrel returning to its nest in the rocks. At the top of this sheer south-facing crag I reached what was to be the highest geographical point of my walk to London – a contour line of 410 metres or 1,345 feet in old money. This was nearly 550 feet lower than the trig point on Pendle Hill summit a few miles to the north-east. Deerstones reveals physical evidence of the strangest creature ever to walk over Pendle Hill. Namely, the devil. Apronfull Hill, once known as the ‘Devil’s Apronfull’, takes its name from Old Nick having accidentally dropped a heap of boulders he carried in his apron when he was hurling them at Clitheroe Castle in the valley below. The scattered heaps of stones on the ridge top today were, in medieval myth, thought to have been the stone litter left by the devil. Walking down the grassy track leading to the quarried boulder field at the base of Deerstones, there are more tangible signs of the devil’s visit. Several fallen boulders have curious deep horseshoe shaped indentations in them. These were believed to be the hoof marks left by the evil old goat as he leapt across the northern hills from Hambleden to Pendle to lay siege to Clitheroe’s stone fortress. It was said that the devil could cover seven miles in a single stride. Fast walker he may have been but he was not a brilliant shot. One of the boulders the devil hurled off the hill towards Clitheroe only got as far as Pendleton village. The path from here heading downhill to the Sabden Valley leads past the ruins of Craggs, a farm still occupied in the early 1900’s, then skirts around the side of the late Victorian Churn Clough Reservoir. The compact mill village down to the right is Sabden, which had its own Lancashire to London traveller in the 19th Century. This was the industrialist Richard Cobden who set up a successful calico print works and helped build a school, libary and workers’ houses in the village. He also had a factory in Manchester and a sales outlet in London. He became the Liberal MP for Stockport and the radical co-founder of the Anti-Corn Law League, fighting for free trade and cheap bread. In these 1830’s days before the fledgling railways had cast their web across the nation, it is interesting to examine how cross-country businessmen like Richard Cobden got about. It is known that he travelled from London to Manchester with business colleagues in the stage coach, the ‘Peveril of the Peak’. The journey took 20 hours. Later in the 1830’s, Cobden brought a horse drawn omnibus of Manchester school children to the village of Sabden. From Deerstones I spent the next four miles walking through the old hunting grounds of the Forest of Pendle. This is a backwater landscape of thin valley pasture, meagre woodland, mullioned farmhouses and open fell. The administrative centre of the medieval forest, clinging to a south facing hillside, is the village of Newchurch. The intricate geography of the Forest of Pendle is best discovered on foot since the motorist sees little from the narrow sunken country lanes that wind up and down through the district. Its central feature is the saucer-shaped valley drained by tiny Sabden Brook from east to west, from Newchurch towards the village of Sabden. On either side of this lowland is tricky countryside for cars – to the north, the moorland of Pendle Hill; to the south, the steep-sided wooded ridge of Padiham Heights. The enclosed nature of the forest played a major part in creating the claustrophobic atmosphere in which the tales of the Pendle Witches developed. The route from the southern slopes of Pendle to the roadside village of Higham was a wander along the actual paths and tracks woven into the superstitious stories of the infamous 17th century coven of poor, farming women, who travelled on foot through the district dispensing their hollow curses on a variety of uncooperative farmers, pedlars, children, cows, dogs and chickens. I passed close to Bull Hole Farm, lying in the low lying rushes of Sabden Fold, where chief witch, Elizabeth Southern, was asked to cure a sick cow but instead cursed it to death. The irate farmer ran off to give his account of such unexplainable witchery to the sympathetic magistrate Roger Nowell of Read Hall, who was gathering the testimonies of locals who had fallen out with Southern and her clan. 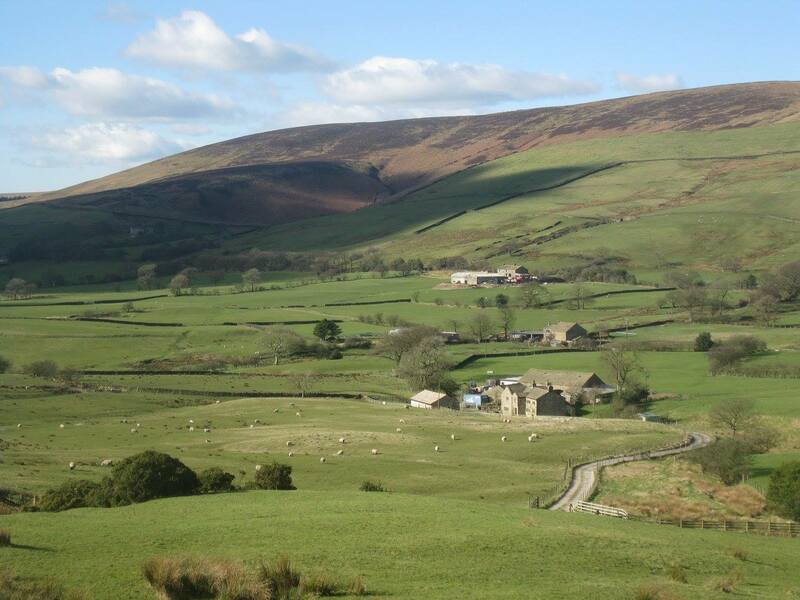 Her notoriety gained her a more impressive and scary moniker, ‘Old Mother Demdike’ and she hobbled around the patchwork of scraggy fields below Pendle Hill being spiteful and vindictive, a vicious streak probably born out of her own helpless poverty. In the testimony of the Bull Hole farmer Demdike had been asked to cure a sick cow. The modern rational explanation is that the cow subsequently died due to its existing sickness rather than a verbal curse by some half-blind octogenarian washer woman. Yet it was the hearsay and false accusations of their neighbours and even members of their own family who finally did for Demdike and her disagreeable company of fools. Nine witches from the Pendle district were hanged at Lancaster Castle in August 1612. Skirting around the east side of Higham village I came close to the roadside building, Ashlar House, where magistrate Roger Nowell first interrogated some of the Pendle ‘witches’. I also followed a footpath which runs through Higher White Lee Farm, the former 17th century residence of yeoman farmer John Moore, whose young son was thought to have been a victim of another of the witches, Anne Whittle, alias ‘Chattox’. The Pendle Witches link with the Moore family of White Lee is an interesting one. Part of the evidence presented at the witch trials leading to their conviction was the case of Chattox bewitching the drink of John Moore. His son, also called John, subsequently fell ill and died in 1610. ‘Chattox’ was spied in her garden hiding a clay image of the son in her apron. Seven years later John Moore and his wife gave birth to another son, Jonas. Perhaps the tale of his poor brother dying at the hands of medieval witchery influenced Jonas, who grew up to be a man of scientific reason. As a mathematician and surveyor, Jonas Moore was employed by James Stuart, the Duke of York, and was involved with one of England’s greatest engineering schemes of the 17th century, the drainage of the East Anglian Fens. He not only surveyed and mapped the Fens but went on to map the River Thames from source to sea, an achievement that impressed Samuel Pepys so much he noted it in his diary. Jonas Moore, born in the superstitious backwater of Pendle Forest, went on to become a founder of the Royal Observatory at Greenwich. From Higher White Lee I crossed the A6068 road where it bypasses the village of Higham. Crossing this fast road marked another change in the landscape as hedged paths led down to River Calder, a softer valley landscape below the heights of Pendle Hill. I was heading for the Pennines and there were still a few miles to go before the county border with Yorkshire was reached.